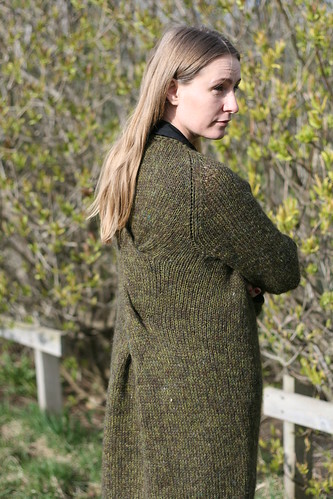 I finished my green cardigan last weekend and it has been attached to me ever since. It is so light and comfortable, yet warm enough for these cool spring days. I found the pattern (free in one size) on the Pickles site, it has a great range of patterns and most of them are offered free in one size and then you can buy the other sizes. The patterns are simple and easy to follow. I have done a couple of projects from them, and they are always great so I can recommend them. The pattern says that you are supposed to knit it back and forth. I started out like that, but I really, REALLY do not like knitting sweaters like that since it is so easy to knit them in the round and then just steek them in the sewing machine. So I quickly changed to knitting in the round and it just flew of the needles. I then steeked it and crocheted one row of single crochet around the bottom, up the front and around the neckline and to the front of the sleeves. When I first saw the project on the Pickles website, I got the image in my head what color combination I wanted to use. At first I thought I would use plötulopi and einband, but the einband (Icelandic lace weight wool) was not available in the color I wanted. 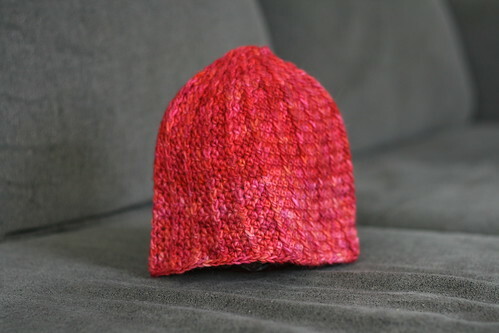 I thought about just dyeing the right color, but then I found the Spinni in the exact color I wanted. Even though it is a bit over priced in my opinion, I got it anyway. I do not regret it one bit, it is just perfect with the other yarn and I love the outcome. And how rare is it to get a vision of what you want in your head and then get the exact outcome when you are finished? So I am one happy knitter! A very fast project, only took me about 3 hours from start to finish. It was a birthday present for our little friend, Þórkatla. This is my third time doing this hat, I just love it. Happy Mothers Day yesterday! These two daughters of mine are the best! And then there is my own mother, who has always been my safe spot to fall when I tumble, my strength when I am drained and the push I need when I am unsure of myself and my own strengths. I love you, mom!